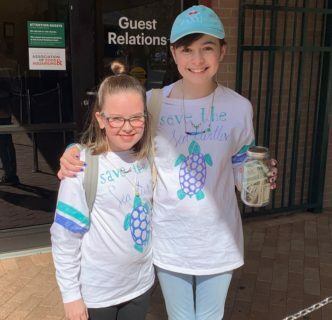 Two Young Houstonians Team up with the Houston Zoo to Save Sea Turtles! We were hanging out with each other one day and we decided to a make some jewelry. We had so much fun making it that we wanted to sell it to raise money for a good cause. The problem was we didn’t know what we wanted to raise money for yet! Later, one of us took a trip to the Houston Zoo. While we were there, we participated in a fun, informational activity about sea turtles and learned that they were on the brink of extinction, and that their numbers were declining rapidly. The activity showed us that sea turtles sometimes think that plastic bags in the ocean are jellyfish, which are a big part of their diet. When they eat the plastic bag thinking it’s a jellyfish, it clogs their throat and hurts their digestive system. This inspired us to use less plastic, and switch to more reusable things such as straws, grocery bags, and water bottles. That then inspired us to do some research about sea turtles and learn more about them. After that, we finally knew what we wanted to raise money for – sea turtle conservation. 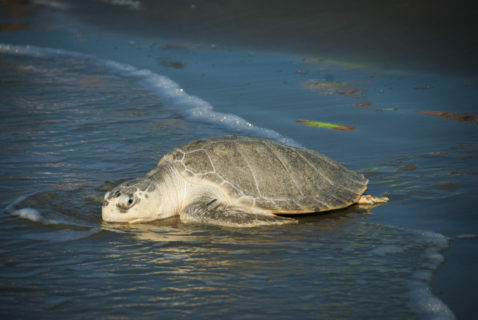 We wanted to donate what we raised to the Houston Zoo because we knew that they have made it a top priority to help many sea turtles in the wild, and help others understand the importance of sea turtle conservation. We both read so many books about sea turtles. We learned a lot about the different types of sea turtles, the health conditions they get, about their lives, how to save them, and more! We think that learning about them was an important part of our effort to save them. While we were reading many books, we were also busy making more crafts and jewelry to sell. We spent endless hours preparing for the sale. When the day of the sale finally arrived, we had a few struggles with the weather, but overall it was a great turnout, and we ended up raising eighty dollars and we gave twenty dollars of our own to donate to sea turtle conservation! When we went to the Houston Zoo to donate the money, we met the sea turtle the Zoo is rehabilitating now in the aquarium and got to talk with staff about sea turtles. We learned so much about sea turtles during our time with people who work at the Houston Zoo and how we can save them. Here are some ways that you can help save them too! Using less plastic waste makes a big impact on sea turtle’s survival. Plastic straws also get stuck inside their bodies in various ways. Plastic water bottles that wash up on the shore get in the way of baby sea turtles on the beach and prevents them from getting to the ocean. All garbage also pollutes the ocean, making it hard for them to come up for air. 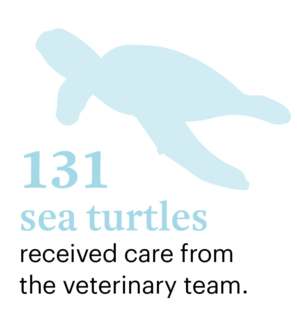 We hope our story has inspired you to help save sea turtles in the wild! Feeling inspired? You can learn more about species like sea turtles and how to save them by attending camp Zoofari this summer! Share via Facebook: Two Young Houstonians Team up with the Houston Zoo to Save Sea Turtles! Share via Twitter: Two Young Houstonians Team up with the Houston Zoo to Save Sea Turtles! Share via Linkedin: Two Young Houstonians Team up with the Houston Zoo to Save Sea Turtles! Share via Email: Two Young Houstonians Team up with the Houston Zoo to Save Sea Turtles!